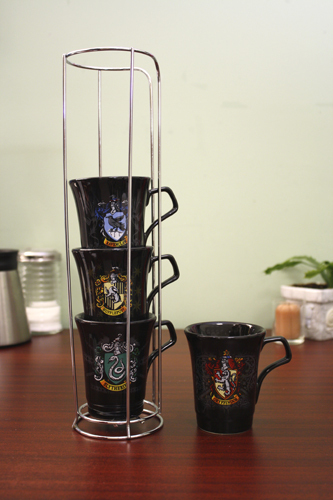 This mug set from Harry Potter is magically space-saving – no spells required! The 4 cups stack on top of each other in a sleek metal holder that takes up less than 4″ of space on your countertop. Each features a different house crest (Gryffindor, Ravenclaw, Hufflepuff or Slytherin), with the movie logo on the opposite side. Metal holder is 13.5″ high; cups hold 6 ounces and are dishwasher safe. Perfect for coffee, or reading tea leaves!